Grown for the very attractive purple foliage Corylus avellana Purpurea is a multi stemmed deciduous shrub to small tree. 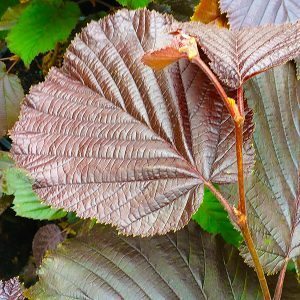 The heart shaped foliage along with the great colour also has great texture, making this a great background shrub or small tree in the garden border. An added bonus is that in late winter to spring purple male catkins tinged with yellow hang below the bare stems making a great display. Best grown in a humus rich well drained soil, this is a plant that can be cut right back to the ground every 2 – 3 years. This is all the maintenance it requires. The cuttings can be used as stakes and supports in the garden if desired. They can also be woven when freshly cut to form interesting carved supports. In autumn the edible nuts appear, smaller than commercial types, however an added bonus. Best grown in a humus rich well drained soil, this is a very hardy plant once established. A position in full morning sun with some afternoon shade in warmer climates is best. Mulch around the plant to maintain a cool root run. In good soils, little extra fertiliser will be required. You can use a general purpose slow release type if desired in poorer soils as needed. Pruning is best by coppicing back the ground in winter every few years if required. Corylus avellana Purpurea is available for sale from the following nurseries.